We live in community. It’s in our DNA. We need one another, plain and simple. Community shapes our identity and quenches our thirst for belonging. It helps us put life into perspective and sort out real danger from perceived danger. Community has the capacity to improve our physical, mental, and economic health, as well as our overall sense of happiness and fulfillment. It has the power to unite us all in a common bond as we work together for a better world. 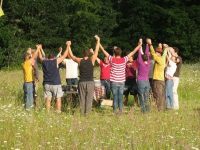 At Tamarack, we like the Margaret Wheatley quote, “whatever the problem, community is the answer.” We hold a belief that when we build communities that are deeply connected and resilient, we will be better equipped to face many economic, social, and environmental issues and uncertainties. A year and a half ago, Tamarack began a journey to learn how we might deepen our sense of community. To explore this idea, we launched the 1000 Conversations to Shape our Future Campaign. The campaign’s goal was to co-host conversations about what community means to people today and discover the kind of communities that people hope to create moving forward. These conversations are taking place in churches, schools, with local businesses, governments, in neighbourhoods and at festivals. Through this process, we wanted to create the space where stories about community could be shared; new connections could be fostered; and, new insights could be gleaned. We hoped these conversations could help uncover the assets and strengths already present in these groups, neighbourhoods, and organizations. Already, more than 130 conversations have been documented, representing the perspectives of a great diversity of groups. This has already generated such rich insights and we are eager to now share some of the common themes and patterns that are emerging across these many conversations. We are becoming more transient as a society. A group of men who had come from the same village in India shared how their family had always lived in that village. Now, their children and grandchildren were spread out across the globe. They talked about how it was hard to keep the family connected. Our neighbourhoods are also being affected. In Hamilton, we met with a group of seniors who proudly shared the sense of connection they felt on their street. They talked about how everyone kept an eye out for each other and how, during the war, the whole street would mourn or celebrate together. In contrast, Jessica from Kitchener-Waterloo talked about how “the people you live next to are not necessarily the people you do life with.” In her neighbourhood, many of her neighbours’ lives were already full with other things and therefore they do not have time for meaningful connection with those on their block. She also shared how many of the people she used to know on her street have now left, making her feel isolated. Instead of putting energy into building connections with her new neighbours, she now focuses on the social groups that have greater stability, like family. Despite some elders’ concerns about the changing experience of community, we found that youth had a far more optimistic view. A group of student leaders in Guelph felt they have new tools that allow them to connect, share, and mobilize in a way that could never have been possible previously. They see their communities as being far more open and diverse than their parents’ generation. Previously, if you did not fit into your community, you were alone. Now, you can find a community no matter who or where you are. We found that this generation feels they can build the communities they want on their terms, seeing a world of possibilities. At the beginning of this campaign, we wanted to understand what people meant when they used the word “community.” We asked over 100 different people. What we found was that for seniors community was grounded most strongly in a sense of place, whereas youth often focused on a common area of interest. This highlights some of the shifting nature of community. When we started engaging with churches, we stumbled upon a debate involving identity and boundaries that a couple of churches were starting to wrestle with. One of the earliest conversations we had was with East Zorra Mennonite Church, which sits in the countryside outside of Kitchener-Waterloo in Ontario. This church community had a special presence about it—a palpable joy that emerged whenever they came together. At the core of East Zorra is this idea of family. For many of the members, this place is more to them than a faith community; the relationships go much deeper.Family implies a strong sense of identity. This identity is important because it makes us feel like we belong, like we are home. At St. Christopher’s Church in Burlington, the group pushed back against the idea of church as a family. They felt that it implied a high barrier to entry. How would it feel to be a new person in a church that describes itself as a family? One person in particular had a negative experience in a church that described itself as a family. She felt that there was a lack of personal boundaries; everyone was in each other’s business. Pat, a member of the leadership team for the 1000 Conversations Campaign in Halton, talked about identity as a set of social norms for interaction and that as these social norms become entrenched they form a culture, which forms a boundary for the group. He talked about how this is often unconscious on the part of the community. At Mannheim Mennonite Church, group members wrestled with wanting to have a strong sense of identity with clear values while also being welcoming to new ideas and people. They debated about how important it was to have clearly defined values and identity, with no clear consensus reached. We found this tension between having a strong sense of identity and still creating space for new ideas existing in many communities. Technology is dramatically changing the landscape of how we interact with each other. “It is now the medium through which we build community,” said a member of the maker space in Hamilton called Think Haus. A group of University of Guelph students discussed how we are able to engage with a much greater diversity of people, ideas, and cultures than ever before. This access to information is helping increase our understanding of each other, thus raising our empathy. It makes it easier for people to jump from one geographic location to another. A group of young adults in Hamilton wrestled with the pros and cons of technology. They talked about how it makes finding people who are the same and also those who are different easier. Technology creates the space for people to expand their perspectives and access great diversity, while at the same time it creates space to foster greater extremism because you can choose to focus very narrowly on things that you’ve decided to care about. Staff at the John Howard Society talked about how most communication is nonverbal and that this type of communication is lost when we move online, which is mainly text-based. As a result, our brains do a lot more work to fill in the gaps, making us susceptible to misinterpretation. As the internet continues to evolve, people find new ways to communicate, as demonstrated by the rise first of emoticons, and later memes and avatars, all designed to help us communicate the nonverbal social cues. Ultimately, though, “a virtual hug or shoulder to cry on does not have the same power as it can in real life,” as an artist in Milton stated. Technology has opened up a lot of opportunities for connection and communication but we are still learning how to use it to support efforts to build a sense of community with one another. At Tamarack we believe deeply in the power of community. It is for this reason we have launched the 1000 Conversations Campaign to learn how we can help deepen and strengthen communities across the continent. We hope the insights from these conversations that we share on www.seekingcommunity.ca will inspire policies, programs, and practices and create space for us all to learn together. We cannot do this alone; we need your help. If you’re a subscriber to Communities, we know that community is deeply important to your life and the work that you do. As such, it’s likely that the insights we’ve shared aren’t anything too new for you. So far, we’ve only collected conversations with mainstream groups. We are eager to hear your thoughts and perspectives on the same questions since we know we have much to learn from you. We’d so value your insights as we conduct this research. Bring together your friends, neighbours, intentional community, colleagues, and have a conversation. Then, share what emerged. Tamarack is sponsoring the next issue of Communities and would love to feature your documented conversation in this issue. For more information about this initiative, visit www.seekingcommunity.ca or email Derek [AT] tamarackcommunity.ca. Derek Alton is Campaign Animator for 1000 Conversations to Shape our Future. ← Best of Communities Collections – New Downloadable Products! Digital Subscription Options Too.